As an exterior cladding material, Portland cement plaster, or stucco, is a versatile material and used in traditional, modern, and contemporary designs. It can provide either an ornate or simple, clean look. But, as the old adage goes, “there are three things in life you can count on …” and the most reliable of these is that when stucco hydrates, it shrinks and hairline cracks form. Regardless of design style, if you design with stucco, it is absolutely imperative to understand how it performs and why. Whether you specify a traditional three-coat application or a one- or two-coat modified polymer system, understanding the basics of Portland cement plaster design and installation will ensure that you get the aesthetics and performance results right, including the building code requirements often found in reference standards and industry best practices. According to doityourself.com, cracks are quick and easy to fix. Small cracks can be filled simply with a coat of paint, while thicker cracks may be cauked. Meanwhile, very large cracks and holes require more attention. You will need to clear out the damaged portion of the stucco and then carefully refill it with several applications of new stucco, while replacing damaged mesh or tar paper if needed. The total thickness of 7/8 in. for three‐coat work is required, in accordance with ASTM C926. While the adage of “all stucco cracks” is generally true, the use of reinforcing mesh or fibers in the plaster, along with correct placement of control joints, can help mitigate cracking. Hot weather and accelerated drying time can also contribute to cracking, thus curing of the stucco is important in these conditions. Controlling cracks in stucco means fewer callbacks for the contractor, lower maintenance cost, and enhanced curb appeal. As another old adage goes, “the best offense is a good defense.” Proper care and preparation of stucco can help reduce the need for stucco repairs later on. The majority of stucco walls, whether traditional hard‐coat or proprietary systems, are installed on metal lath over wood or metal stud construction. As such, they are designed as drainage plane walls with metal lath over a water‐resistive barrier (WRB). Stucco requires weather barrier behind the lath to control the penetration of water. The paper must be continuous and properly shingled over each sheet and accessories to direct the flow of water. The weather barrier gets wet during application of the stucco and, after drying, pulls away from stucco, creating the drainage plane. 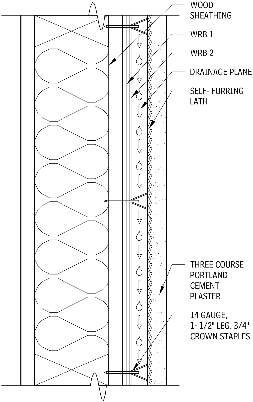 Best industry practices are to use a rainscreen system, incorporating a drainage mesh between the WRB and the lath. The basic components of the wall and their requirements can be found here. 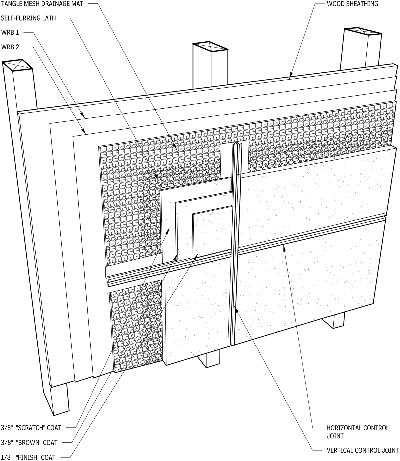 The selection, installation, and protection of the WRB are the most critical components in the weather‐resistance of the wall. The WRB should be installed with cap nails, screws, or wide crown staples; slap staples can tear the barrier and should not be used. Care should be taken to seal wall penetrations and protect the WRB. When installation of multiple layers of WRB is required, each layer shall be installed in an independent manner so that each layer provides a continuous drainage plane. Building wrap and fluid‐applied WRBs have increased in popularity and are accepted by building officials as an alternate material to asphalt felt. The Code requires that these types of WRBs be installed in accordance with the manufacturer’s installation instructions, which may include taping of joints of sheet material, when used as an air‐barrier. If two layers are required, local codes may also require a specific layering pattern. For temperatures lower than that, the ingredients themselves can be heated before mixing the plaster. Water and sand are good at holding heat due to their mass, although water is simpler to heat up. If it comes to it, both can be heated and used to provide some extra protection when performing stucco repairs in cold weather. To avoid problems such as flash set of the plaster, though, cement.org does advise that “fresh mixtures should not be heated to temperatures exceeding 120 degrees Fahrenheit.” Additionally, the concrete should be kept from freezing for at least two days following its application, since any excess water will expand and your wall will begin to crack … before it has even had time to set. Stucco is a traditional exterior finish material, typically three coats of Portland cement plaster, applied over weather barrier to create a drainage plane wall system. It is impact‐ and fire‐resistant; and because it is applied in a plastic state, it can be made to conform to virtually any shape. Durable stucco is, however, highly dependent on knowledgeable and skilled application, as many of the problems attributed to stucco (e.g., cracking, delamination, water leakage) are not inherent to the product but are the result of improper installation. Stucco is applied in three coats: scratch, brown, and finish. The scratch and brown coats are Portland cement plaster, typically each approximately 3/8‐in. thick; together they are called the base coat. The base coat must be moist‐cured for two days, then further curing of five days before application of the finish coat. In very hot or windy conditions, it may be necessary to protect the base coat with tarps or sheeting. The scratch coat is so‐called because, after application, the surface is roughened with a rake or other device to promote a mechanical bond of the brown coat. The brown coat is applied after the scratch coat has set up. IBC requires a minimum or 24 hours between coats if damp‐curing is used, or 48 hours without. In the recent past, one week was common for curing. It is important that the scratch coat be properly cured before the application of the brown coat, to minimize the cracking. The brown coat may be reinforced with a variety of fibers, and it must be trowel‐floated while still moist but after taking an initial set, to densify the surface and further reduce cracking. Application of the brown coat before the scratch coat has properly cured, and failure to make the additional trowel‐float pass, are common causes of cracking in the finished stucco. The finish coat may be either Portland cement plaster or acrylic, typically 1/8‐in. thick. Portland cement‐based finish coats are likely to be more durable, but acrylic finish coats generally have better color consistency. Factory‐mixed finish coat mixes improve color consistency of cement‐based finish coats.